Pet Blog: In The Naming of Cats, Can an Animal Communicator Help You Understand Your Cat's Real Name? 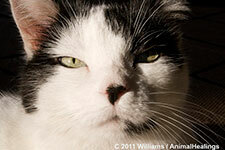 In The Naming of Cats, Can an Animal Communicator Help You Understand Your Cat's Real Name? Now to go beyond this legendary poem, as animal communicators we can dig deeper into cat (and pet) names. Cats within their own circles have names for each other. Animals communicate telepathically, so there are names that they share and recognize each other by within their own communication means. Sometimes these names can correspond very closely (if not exactly) to the pet family names we have chosen. Read More about "In The Naming of Cats"
Learn more about our professional animal communication and Reiki for animals and see how we can help your whole pet family in so many ways!